Friends, today’s featured freebie is a free version of an amazing and beautify fancy scene generator kit. 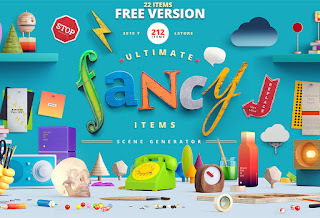 The free version contains several items to create your own ideal fancy scene, but the good part is that the premium full version comes with a huge 210+ items to help you play with your own fancy and imagination and create numerous scenes for your website headers and banners or graphics. Download the freebie and check it out for yourself. So sweet! !